San Francisco on Jan. 1 will become the first big city in the U.S. with a minimum wage topping $10 an hour. That’s deepening tensions between business owners worried about rising overhead and workers struggling to make ends meet in this costly town. Among the businesspeople concerned about the change is Steve Sarver, owner of the San Francisco Soup Co., a restaurant chain with 12 of its 18 locations in the city. He says many of his more than 200 employees earn close to the minimum wage, so the increase will add to his rising costs—which include credit-card transactions fees and rent—though he declined to say how much his overhead would grow. “This is part of doing business in San Francisco, but it also makes doing business in San Francisco more challenging,” Mr. Sarver says. But for Ben Zhu, a 45-year-old who busses tables at a restaurant that he declined to name, the minimum wage is crucial. Through a translator, he says the restaurant where he works slashed his hours from up to 50 a week during the summer tourist season to 12 a week today. Miranda Tang, a manager at National Apparel, said San Francisco’s higher minimum wage hurts employers, but the company is staying in the city. “Even though we live in affordable housing, it’s still hard to make ends meet,” says Mr. Zhu, who has a wife and a 7-year-old son. He also makes some money in tips and through a sales job he can do from home, and he recently participated in a paid medical study. The raise in the minimum wage will boost Mr. Zhu’s monthly income from his bussing job, aside from tips, to $492 from $476. “The increase at least provides some small amount of help,” he says. The automatic wage increase, pegged to inflation, will lift San Francisco’s minimum wage to $10.24 an hour from $9.92 now. While the federal minimum wage won’t change on Jan. 1, several states will also see minimum-wage increases commensurate with inflation. 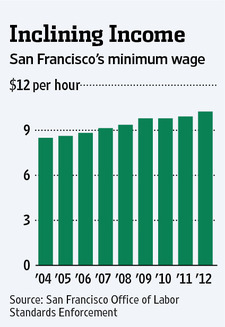 San Francisco is one of a few big cities nationwide with its own minimum wage, along with Santa Fe and Albuquerque, N.M. That’s the result of a local ordinance that was passed after San Francisco residents voted in 2003 to set a minimum wage and deemed that it should be adjusted every year, rising with the consumer price index. “It’s been going on for enough years that employers know to expect an increase that’s consistent with inflation,” says Donna Levitt, manager of the city’s Office of Labor Standards Enforcement. “It provides some protection for San Francisco’s most vulnerable low-wage workers, and it also stimulates our local economy” since workers have more cash to spend locally, she said. But Rob Black, executive director of the Golden Gate Restaurant Association, a trade group, argues the rising minimum wage encourages businesses to consider leaving the city and slows growth of new jobs—hurting not only the businesses themselves but also their employees. Nationally, much of the research on minimum wages is conflicting or inconclusive. A peer-reviewed study on San Francisco’s minimum wage, conducted in 2004 by a University of California, Berkeley, labor-research institute, found no noticeable impact on employment numbers or the likelihood of employers leaving the city. The study did find that the local minimum wage increased workers’ tenures in minimum-wage positions. The study also found that restaurants appeared to pass their added costs from minimum-wage increases onto customers. Arindrajit Dube, a professor at the University of Massachusetts, Amherst, who co-authored the study, and his colleagues found a 6.2% rise in fast-food prices in San Francisco compared with the East Bay. Prices at sit-down restaurants rose 1.8%, an increase that wasn’t statistically significant. Despite higher costs associated with the rising minimum wage, many companies say they aren’t in a position to leave the city. That includes National Apparel Inc., a closely held sewing, cutting and pattern-making company in the South of Market neighborhood that has halved its work force in recent years to about 30 employees, mostly minimum-wage seamstresses. 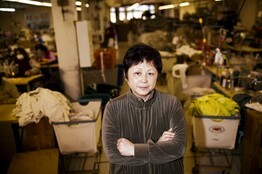 Miranda Tang, a National Apparel manager, says the company considered moving outside the city limits and away from the higher minimum wage. But most employees take public transportation to work and would have a hard time getting to a factory elsewhere. So National Apparel has stayed in San Francisco.